Stopping Power in advertising can be defined as an advertisement’s ability to capture audience attention and interest. For a print advertisement this would represent an ad causing a reader to stop reading an article or flipping the pages and take notice of the ad. For a video commercial this would represent an ad’s ability to capture a viewer’s mental attention (versus such things as competing screens, idle conversation, a quick zap from the remote or perhaps a journey to the fridge for a snack). Logically, stopping power would be expected to raise the likelihood of viewers actually receiving the advertisement’s intended message. Among the various ways to measure stopping power, MSW-ARS has used the Scene-to-Scene Trace technique to gauge respondent interest in a commercial. The Scene-to-Scene Trace illustrates how quickly the ad is able to build – or lose – interest, making it a meaningful measure of an ad’s stopping power. One useful metric we have derived from studying interest profiles is the slope of the interest profile in the first 5-seconds of a video advertisement. 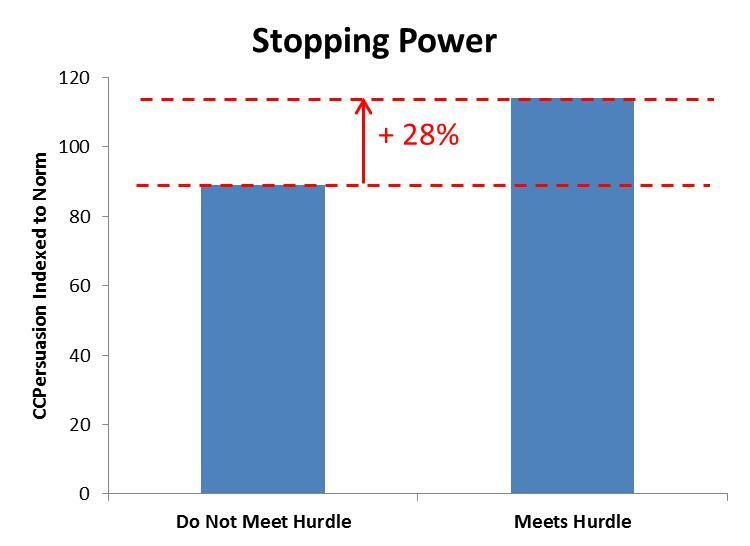 A stopping power hurdle based on the opening slope of the interest profile has been established. The 41% of cases in the MSW-ARS database which were able to attain this hurdle have CCPersuasion® scores which are substantially stronger than those which do not exceed this hurdle. 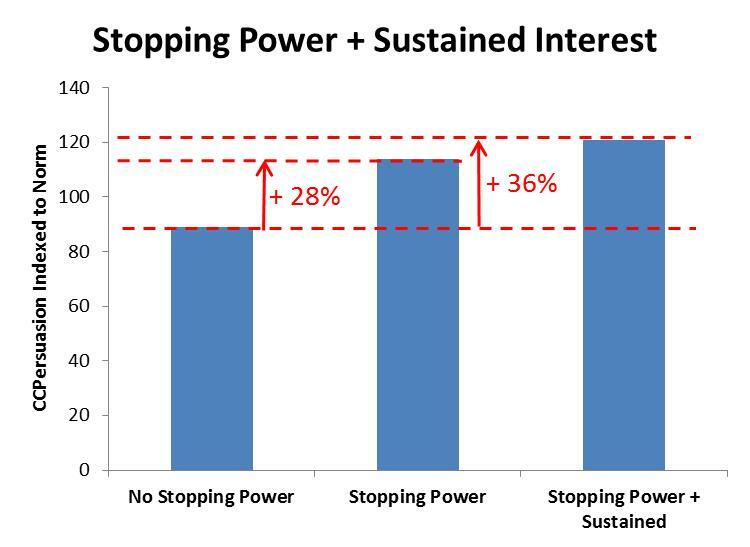 While stopping power is clearly beneficial, it should be noted that it is equally important to sustain interest throughout an ad. In fact, those ads that are able to grab attention and hold onto it (by meeting an average interest level hurdle) have even stronger CCPersuasion results, on average. A study published in the paper “The Stopping Power of Advertising: Measures and Effects of Visual Complexity” (Pieters, Wedel & Batra, Journal of Marketing, September 2010) assessed the effect of visual complexity on stopping power for print advertising. This study found that two types of visual complexity – Feature Complexity and Design Complexity – had opposite effects on the stopping power of print ads. According to the paper, ads with feature complexity “contain more detail and variation in their basic visual features, color, luminance, and edges” and are “visually cluttered”. Ads with this type of complexity were found to have poor stopping power. 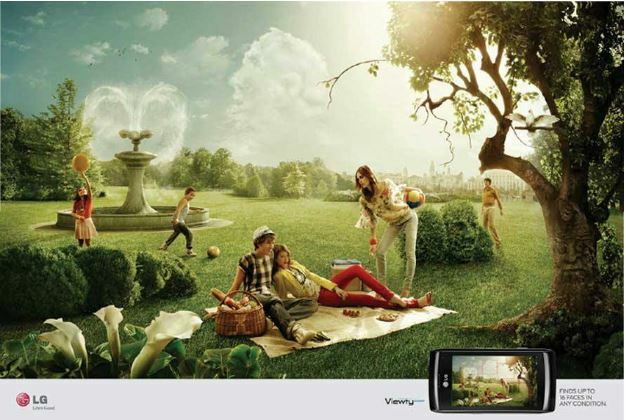 As an example, this ad from LG is extreme in the detail and variation of its visual features and colors. Ads with this type of complexity were found to have strong stopping power. 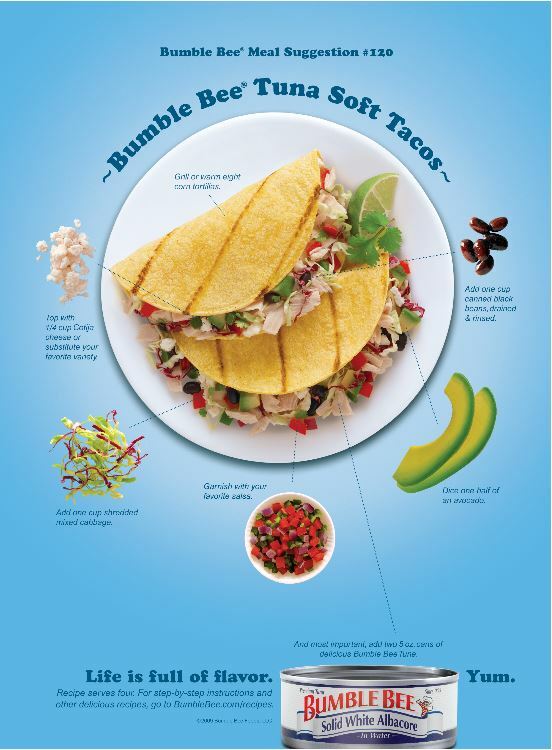 This ad from Bumble Bee has a relatively large number of distinct objects which are irregular and dissimilar (particularly the different ingredient pictures) with extensive detail in the dominant image. The offset of the can provides an additional feeling of asymmetry and irregularity of object arrangement. Facial Close-Up: This was particularly true for beauty care ads. Note that research has shown that faces have a strong tendency to draw viewer attention and so are likely to detract from the ad’s effectiveness if the facial image is not related to the product itself. Children: Caution is also advised in using children, as most of the cases with children had weak CCPersuasion scores possible due to the presence of children not being consistent with the ad’s message or taking attention away from focus on the product. Note that many of these elements are consistent with the idea of design complexity in that they are related to creativity and the presentation of ideas in a visually unique and engaging manner. A number of the most successful cases have no spoken words in the first 5 seconds but instead use music or visuals to gain viewer interest and attention. Also it is important that the brand’s identity and the ad’s message not get lost in pursuit of misguided creativity (that which entertains but does not sell). The following ad for Kohler had very strong stopping power, with an opening slope of over 3 times the hurdle level. Not only does it have lively music and a brisk pace, it also is completely product focused and demonstrates the product’s functionality in a creative way. It also seems to adhere to the principles of using visual complexity by keeping it simple (avoiding the visual clutter of feature complexity), but also attaining design complexity through varying not only the number, arrangement and size of the shower heads but also the speed and type of demonstrations. TurboTax’s Humpty Dumpty ad brings both suspense (the urgency of the armor clad men rushing through a modern urban landscape) and surprise (the unexpected visual of the shattered figure of Humpty Dumpty) in its first five seconds. The opening of the following viral ad for Miss Dior perfume features a facial close-up (of Natalie Portman) which may work in this case since the product is all about allure and image. Its music also evokes a feeling of tension and suspense which likely aids in generating strong stopping power. Kia’s popular Super Bowl ad featuring Melissa McCarthy opens with a shot of a Kia driving through a forest of soaring pines. Ultimately this opening visual of scenic beauty is tied to the message of Kia’s crossover vehicle being the most fuel efficient in its class.